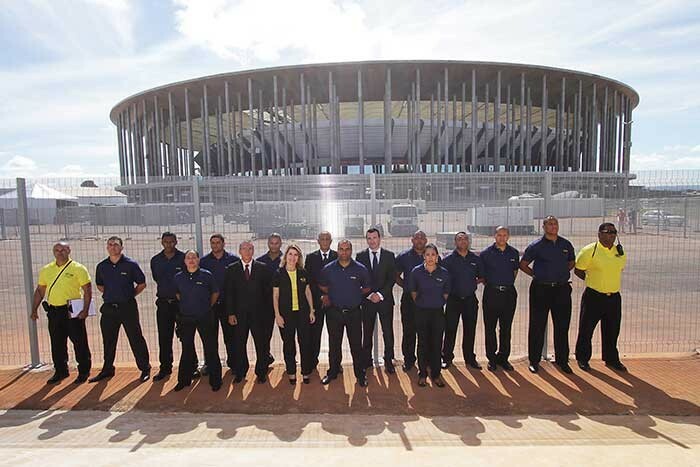 Sword, the Republic of Ireland’s premiere crowd safety and security company, has delivered tens of thousands of man-hours with international ‘best practice’ standards in service levels, including a late call ramp-up, to an appreciative client at the FIFA Confederations Cup in Brazil. Sword’s Eoghan Gill, chief strategy officer, acted as delivery director for the event. Sword also recently appointed Bert van Horck as its chief operating officer, based in London. Van Horck had previously led the International Crowd Management & Security Group (ICMS) and Showsec. Sword successfully assisted LOCOG (London Organising Committee of the Olympic and Paralympic Games) last summer by providing crowd management and stewarding at the 2012 Games for key locations including the Olympic Park. Eoghan Gill, speaking about the tournament in Brazil, comments: “On behalf of our client we sourced, selected, contracted, trained and managed security and stewarding staff for the 2013 Confederations Cup. The award-winning company, founded in Ireland in the late 90s by Diarmuid Smith, first expanded into the UK in 2006 and has contracts from the UK, Ireland and Brazil. The FIFA Confederations Cup was won by host nation Brazil, who beat world champions Spain, and saw David Luiz of Benfica and Chelsea belatedly become a star in his own nation. 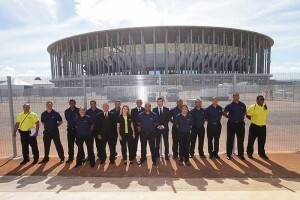 In picture: the Brazil Sword management team.